Free Gift Card When You Sign Up for this AARP Sweepstakes! You are here: Home / Sweepstakes and Contests / contest / Free Gift Card When You Sign Up for this AARP Sweepstakes! Want to be rewarded for a healthy lifestyle? That’s just what the AARP Sweepstakes wants to do! Sign up with AARP Rewards for Good, learn about the program, and receive a free $20 gift card INSTANTLY! Plus, you will be entered in for a chance to win $25,000! Complete activities that focus on your personal well-being and earn points that can be redeemed for gift cards, daily deals, auctions, select brands, and much more! What are you waiting for? Click here to enter the best online sweepstakes around! 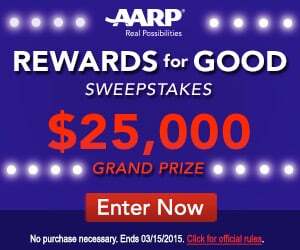 To enter this AARP Sweepstakes, you must be 45 years of age or older.